For the past few weeks, my husband has been watching the baseball playoffs, so I have been, too, and I've decided that I should become a baseball fan. Everything that they say about the game is true: It's elegant, it's subtle, it has this strange mix of skill and luck, players don't injure their brains playing it. Here's what they don't tell you about baseball: It makes you miserable. Watching my husbands face last night while the Phillies were marching toward their one run loss of the game and so the series, it was full of pain. David is usually ebullient. I rely on his positive energy but baseball robbed me of that. Even in profile. I could see the parade of horribles marching across his forehead. And it wasn't just him. Everyone in the stands looked awful. Even when there was hope, when the Phillies had men on base and an out or two to spare, you could practically reach into the TV screen to cut the tension in the crowd. Seriously, it felt like watching the first (and best) season of "24". When I mentioned this state of perpetuated pain to a baseball fan (not my husband) he said, "But that's the beauty of it!" Apparently if you love baseball, you relish the sweet tension of it all. But if you, like me, can't look at a traffic jam without seeing the melting glaciers of the Himalayas, then maybe tension inspired by not knowing what combination of skill and luck is going to work out and for whom isn't what you, or I, need. I don't know if I'll fall in love with baseball next season, but I do know that the one happy accident of the Phillies' failure to make it to the World Series is I won't have to endure the terrible pressure of watching the games. And now, I have the whole winter to get ready for next season. In the meantime, I'll stock up on worry beads. Here's some news. I've just started blogging for Babble's Strollerderby. Here's an example of me catastrophizing about the future and here's one about football and here's my take on soda for everyone. I won't be listing my posts again but since there are so few, I thought I'd start out with a bang (or a fizz, as the case may be). I will keep blogging here. This week is very hectic, but I'll find a groove because there's stuff I'm going to want to talk about here. OK, you might think I'm biased when I go on and on about how great In the Kitchen with a Good Appetite is, but you'd be wrong. I may be friends with the book's author, but that doesn't mean I don't know what makes a good recipe. And I'm not the only one. Check this out. And, I just showed the book to our fantastic sitter, and her response was this: "I just read some recipes and you think they're going to be really hard, but they're not!" I made my daughter a poncho for the first day of school. That day, my son asked, shyly, if he might try it on. When he did, he asked if he could have one, too. So we went to our yarn shop (the fantastic Yarntopia) and he picked out his yarn. 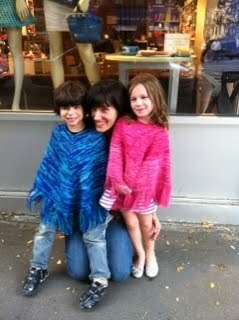 And today, I give you the ponchos. Every since that Louis Vuitton ad with Bono and his wife Ali Hewson started showing up in my New Yorker, it's bothered me. I read the small print and noted that they're wearing their own line of clothing (49 percent of which is owned by Louis Vuitton). I know the clothing they make is sustainable, and it costs a small fortune, and I'm sure they're giving away a lot of the money they're making from the campaign and the clothing line to support a variety of projects in Africa. But still, that ad drives me up the wall. The photograph of the two of them: The golden sun, the tall African grasses, the small plane, it's all so Out of Africa, evoking an intensely romanticized image of the white adventurer/colonial (even well-meaning colonial). I don't know much about the history of the African continent as a whole or any individual country in it, but I do know that, generally speaking, the colonial experience was not a happy one for Africans themselves. Invoking the most gorgeous aspect of its most popular representations, even in service of raising money whilst selling very expensive handbags, seems ill-advised at best. The photo might be beautiful, but what it calls to mind isn't so pretty. Generally speaking, I don't like to give parenting advice. I don't feel it's my place. But today I have a tip about which I feel great confidence. If your child loses a tooth, don't forget to invite the tooth fairy to visit that very night, even if you lose the tooth before it goes under the pillow. No matter what, the tooth comes out, and the tooth fairy should come. "I confess I don’t think either charters or teacher unions are the primary issue here (in education reform). If I had to summarize the progress we’ve made in education over the last decade, it’s that we’ve move beyond the illusion that we could restructure our way to a good education system and we’ve finally begun to focus on the core issue: the nature of the relationship between the teacher and the student. Is it just me but does the phrase "trust and affection" sound pretty mushy? Now, in elementary school, it's the case that warmth is essential for younger students. As kids get older, though, I'm not sure it's true. Teachers should love what they do and believe in the potential of each student, but I don't think love is the answer here. For me, personally, the most effective high school teacher I had was the most terrifying. Her nickname was "Dr. Demon." She pushed and demanded and pushed some more with not a hint of affection. I don't think she really liked any of us. Years later I saw her at synagogue, I was still terrified of her but forced myself to thank her for being such a good teacher. She had no idea who I was. Still, I learned from her. I learned a lot from her. Then again, terror isn't the answer, either. But rigorous instruction that understands and meets the needs of the students in the room? That surely is. Love it or lump it.